Kelvin Chew Deemed Worthy in Beijing! 1029 players showed up at Beijing, hoping to earn the favor of their gods and compete for their blessings. When all was said and done, it was Team MTG Mint Card's Kelvin Chew who earned eternal glory for himself! This weekend, thousands of players discovered the ancient and powerful civilization of Amonkhet. 1029 players showed up at Beijing, hoping to earn the favor of their gods and compete for their blessings. When all was said and done, it was Singapore's Kelvin Chew who earned eternal glory for himself. 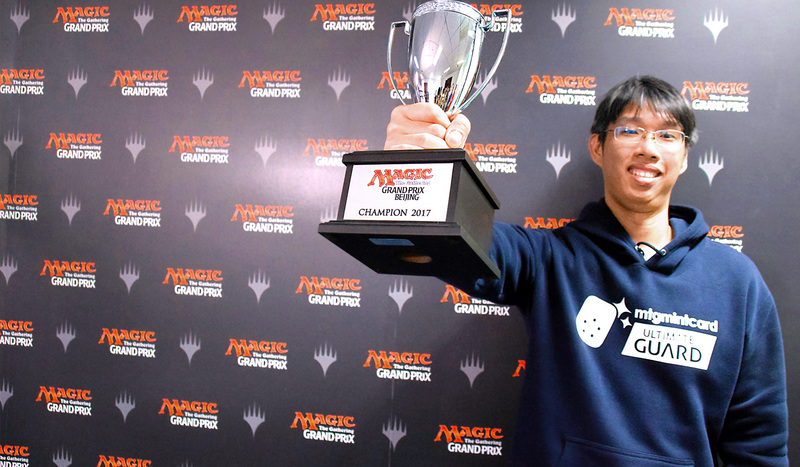 This victory was a great morale boost for Team MTG Mint Card who was atop the standings of the Pro Tour Team Series leaderboard. Chew credits his victory to his supportive teammates, who cracked the format and gave him the additional push to shine more than he already did. Also, tomorrow happened to be Chew's birthday, which meant that a shiny trophy was a memorable gift for the joyous occasion! Piloting a hyper-aggressive White-Red deck containing Trial of Solidarity and no less than five Cartouche of Zeals, Chew steamrolled past Riki Kamo in the quarterfinals, dispatched Tomoharu Saito (who was playing in his 25th lifetime Grand Prix Top 8) in the semifinals, before taking down Keita Kawasaki in the finals! The rest of the Top 8 include quarterfinalists local hero Zhi Yimin, and Grand Prix Champions Takuma Morofuji and Riku Kumagai, as well as semifinalist Xuan Wu! And then, there were some things that were certain about Amonkhet Limited. Cycling was not only a very popular mechanic, but also a rather powerful one. In addition, embalm proved to be of great importance and even the seemingly innocuous Sacred Cat had its little moment in the sun. The Cartouches and Trials were embraced with open arms, while exert and aftermath all led to very interesting interactions and dynamic gameplay! As one of three Grand Prix Champions to be crowned this weekend – we still have Grand Prix Bologna and Grand Prix Richmond to focus upon – Chew had proven that he was deemed worthy! Congratulations to Kelvin Chew once more! You've earned a place alongside the God-Pharaoh, if you're willing to accept the “high honor”! 1029 players arrived at Beijing, the first of three stops during this exciting triple Grand Prix weekend! After nine rounds of Amonkhet Sealed Deck, only 326 players will return tomorrow for six rounds of Amonkhet Booster Draft. At the top of the standings are Guan Jian, Wu Xuan, Yang Yi, and Grand Prix Tokyo Champion Riku Kumagai, the only four 9-0 players at Grand Prix Beijing! Additionally, Chinese household names and Team World Champions Zhang Zhiyang and Li Bo are also at 8-1, as well as Chinese Taipei's Huang Hao-Shan, Hong Kong's Shair Chung Ngai, and Malaysia's Wee Pang Ming. After that, a slew of veterans litter the field, including No. 23 Yuuya Watanabe, Tomoharu Saito, Yuki Matsumoto, Kelvin Chew, Kiwanont Sukhum, Yu Yin, Wu Kon Fai, Gu Fengwen, Han Bing, and Sun Bo, all at 7-2 and all shooting for repeat Top 8 appearances! That's a lot of experience! Day One is done here at Beijing but things are just getting started at Grand Prix Bologna and Grand Prix Richmond. If you're hungering for more Amonkhet action, you know where to find it! See you tomorrow!